This is very much like the slaw we make in our deli and people come from other counties just to get this slaw. I tried cutting down the ingredients from the huge amount we make at the store and it comes out to very much like this recipe. Except we don't use any oil in our dressing. You don't need it. Just added calories. We use a good mayonaisse instead of salad dressing and our slaw dressing would come out to 1 cup of mayo, 2/3 cup sugar and 2.5 tablespoons white vinegar. About 1.5 pounds of shredded cabbage and one shredded carrot. We don't use onions in our slaw although some probably would like that. I would probably use a good sweet onion like a Vadalia maybe. I'm thinking I'd also use celery seed instead of poppy seeds. 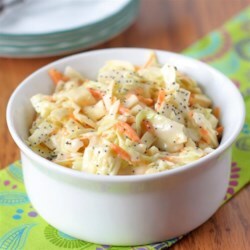 We use celery seed in our pickled slaw and it's good! Letting it sit a while is the key. That loosens up the dressing. Just remember to stir it good before serving.